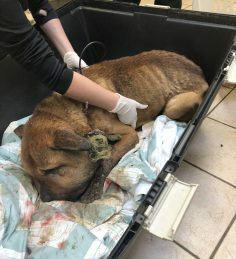 Charges for animal cruelty are being pressed onto a couple in Duncan, British Columbia after BC SPCA constables witnessed a disgusting episode of animal abuse. BC SPCA special constables seized a chained up, emaciated dog from Anderson Joe and Melissa Tooshley on February 16, 2018. Constables had received an earlier report of a dog in distress. Upon arriving on the property they found a “medium-sized dog on a tether that was only inches long, standing in a large pile of mud and feces”. Marcie Moriarty, chief prevention and enforcement officer for the BC SPCA admits that “it’s one of the most profoundly shocking and disturbing cases of abuse [they] have ever witnessed”. 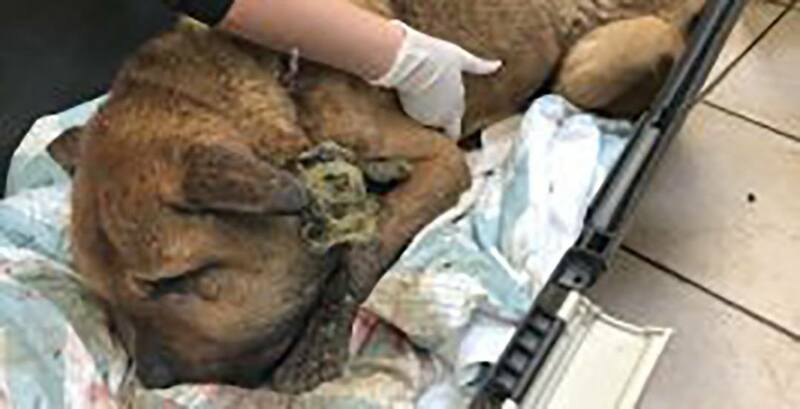 Upon nearing the dog there was an “overpowering stench” and not only was the dog severely emaciated, “but his collar was deeply embedded into his neck, causing massive infection.” The dogs head had swollen to almost three times its normal size. Unfortunately, even after emergency surgery and around-the-clock care was provided, the dog passed away two days later. If convicted, Joe and Tooshley will face a maximum penalty of five years in prison, a $10,000 fine, and a lifetime ban on owning animals.